Great Opportunity to purchase a very well maintained brick turn key church. Ready for a new congregation, possible Day Care or other potential purpose. 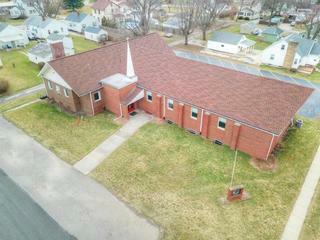 Great Opportunity to purchase a very well maintained brick turn key church. Ready for a new congregation, possible Day Care or other potential purpose. 5360+/- sq. ft. on 123’ x 140’ city lot with blacktop parking for 30 cars and additional parking available. Main sanctuary is approx. 35’ x 70’ with 29 pews, on main level are 2 offices, restrooms, and 2 rooms for nursery. On the lower level, there is a large kitchen complete with side x side frig., 2 elect. stoves, and lots of cabinets & counter space, just off the kitchen is a large room which could be great for entertaining but has folding curtains to petition into smaller rooms. There are 2 other rooms, 1 with rubber flooring for exercising or kids play area. Two restrooms and the mechanical room finishes out the lower level. Terms: 10% buyers premium in effect and added to final bid price to determine contract price. 10% down (non-refundable) with balance due in 45 days. Sells in as-is condition. Has gas heat, central air, wheel chair access. To view or more information please call office.